Introduction: The treatments at ‘Kairali’ are designed to uplift your spirit by strengthening your body and mind. They are based on 6000-year-old Ayurvedic health principles of India to help you realize the best balance of physical, emotional and spiritual energies. We incorporate a holistic ancient approach, therapuetic methodology that encompasses non-invasive herbal infusion and Abhyangam (massage) therapies. A variety of therapy techniques are employed following the consultation with our Ayurvedic doctors or Technicians. Certain body treatments when taken in combination can provide greater results. We have specially designed these packages for your best benefits and optimum spa experiences. Herbal poultices (bundles) are prepared with various herbs and medicated powders. These poultices are warmed in medicated oils and used to massage the entire body, neck, shoulders, hands and back, shifting the person from side to side. This massage can promote better circulation within the affected area thereby promoting increased perspiration, which helps the skin to eliminate wastes. It also helps to tone the skin and can be superbly relaxing. This is one of the special massages for rejuvenating the whole body. The prescribed medicated oil is applied on the head and the entire body, is covered with medicated oil. In this treatment the patient lies on the Droni (a wooden bed specially designed for the purpose). Next a piece of linen dipped in warm medicated oil is squeezed on to the patient’s body as the body is continuously massaged. The massage is very slowly with light pressure. This massage protects you from illnesses and improves your immune system adding vitality and health to your life. It also aids in the healing of rheumatic diseases, blood pressure, pain in the joints and diabetes. The body is massaged with small linen bags (bundles) filled with cooked Navara rice, which is cooked in cow’s milk and a specific herbal mixture These bags are dipped in the same mixture and applied over the whole body of the patient. The bags are not too hot or too cold. After wiping the body with a dry towel, the medicated oil is again applied. The course is 14 days or 21 days. It is one of the most excellent forms of treatments to impart luster to the skin and nourishment for the body through the skin. It also cures various ailments. Lukewarm, medicated oil is applied to the entire head. A leather cap is then placed on the head to maintain the temperature. The course of treatment is effective for migraine, deafness, diseases affecting cranial nerves, facial paralysis, insanity, diseases of the head and eyes, chronic cold, sinusitis, rheumatism, arthritis, abscesses and wounds etc. In fact this treatment is good for all diseases. Herbal oil is applied on the head and massaged. Varti (a special cloth) is tied around the head and thereafter the herbal paste is applied with uniform thickness all over the head. After 45 minutes the paste is removed and the head is wiped clean. This treatment is very good in the case of hair loss, dandruff, graying, insomnia, low blood pressure (BP) and chronic sinusitis. This therapy is used in cases of memory loss, severe headache and insanity. 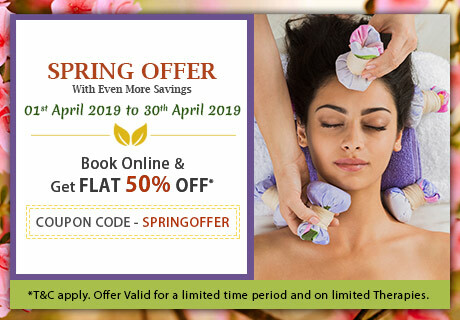 Kairali Beauty Therapy treatments reduce pimples, wrinkles, acne, sagging skin and hair loss through the use of head massage, facial massage and face packs. This beauty treatment is part of a complete treatment of the body. 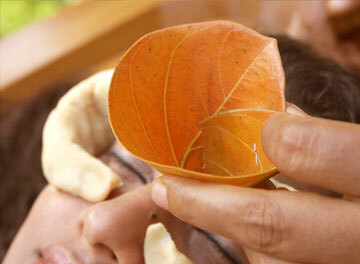 After the facial massage Kairali’s face pack is applied and can be left on until the full body massage is complete. This makes the skin soft and glowing. This is done by allowing clarified butter (Ghee) to remain in the eyes, which strengthens the optic nerves and improves the eyesight. This is a process of washing the eyes with medicated mixture or oils. This helps to relieve tension in the eyes, thus improving eyesight and eliminating pain and fatigue. It brings luster to the eyes and smoothes away wrinkles.